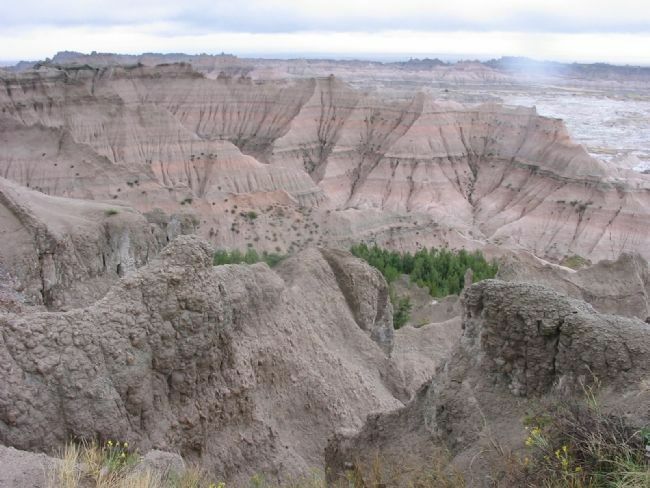 Thirty-seven million years ago, the ancient crystalline core of the Black Hills had already been exposed by erosion. The long blue profile of those mountains, visible to the west, looked much as it does now. About that time, streams flowing from the west began to deposit sediments in this area. 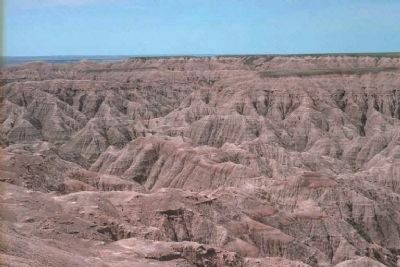 Most of the sediment was wind blown volcanic ash which had settled into the watershed which fed the streams. 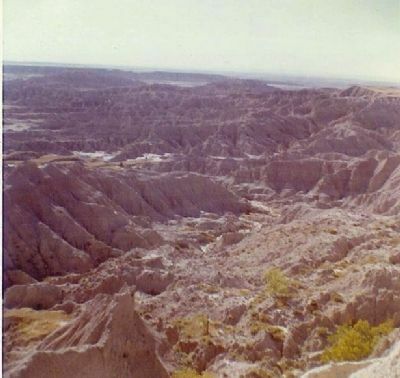 Occasionally the rivers brought gravel and stream-worn rocks from the Black Hills themselves. The ash weathered into clay, and turned into rock. 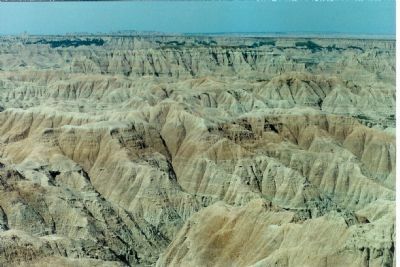 Erosion did not begin to gully the Badlands layers and foretell the present landscape until quite recently, perhaps only half a million years ago. Location. 43° 52.157′ N, 102° 14.092′ W. Marker is near Wall, South Dakota, in Pennington County. 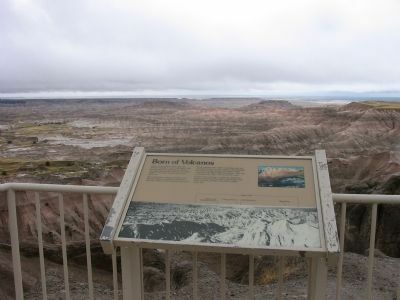 Marker can be reached from Badlands Loop Road (State Highway 240) 0.4 miles east of Sage Creek Rim Road, on the right when traveling east. Touch for map. 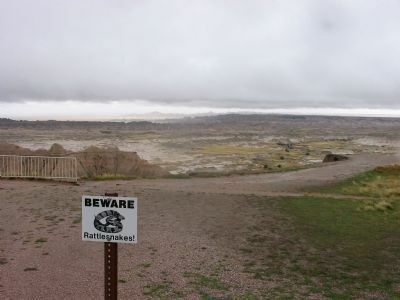 Marker is in Badlands National Park (fee to enter) at Pinnacles Overlook. Marker is in this post office area: Wall SD 57790, United States of America. Touch for directions. 17 miles of this marker, measured as the crow flies. 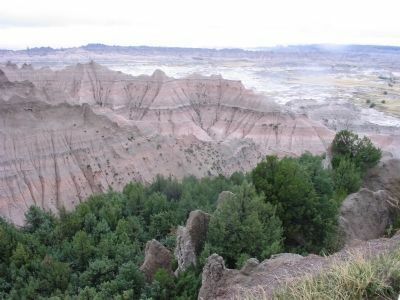 The Big Badlands (about 400 feet away, measured in a direct line); Jungle on a Seabed (approx. 2.7 miles away); High Security (approx. 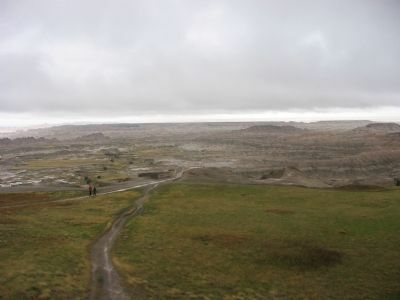 5.7 miles away); Journey to Wounded Knee (approx. 7½ miles away); Purple Heart Memorial Highway (approx. 16.8 miles away); Cheyenne River Rest Area (approx. 16.8 miles away). More about this marker. Marker is on the edge of a cliff at the end of a walking path. More. Search the internet for Born of Volcanos. Credits. This page was last revised on June 16, 2016. This page originally submitted on December 28, 2007, by Keith L of Wisconsin Rapids, Wisconsin. This page has been viewed 1,499 times since then and 3 times this year. Photos: 1, 2, 3, 4, 5. submitted on December 28, 2007, by Keith L of Wisconsin Rapids, Wisconsin. 6, 7. submitted on January 6, 2008, by Mike Stroud of Bluffton, South Carolina. 8. submitted on May 31, 2009, by R. Zebley of Rapid City, South Dakota. • Craig Swain was the editor who published this page.